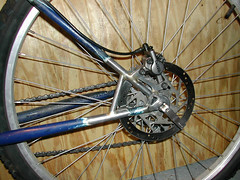 The rotor has enough room to clear the stays. Only really a problem if using big rotors or wavey-davey stays. If the frame has mudguard or pannier eyelets, these will probably have to come off. In fact if you want to fit panniers to a frame with discs that’s a whole other story. I’ve put a few photos on the gallery of the last conversion I did (before paint).